We’d love your help. Let us know what’s wrong with this preview of An Everyone Culture by Robert Kegan. Exact ISBN match. Free Priority Mail upgrade on US orders. To ask other readers questions about An Everyone Culture, please sign up. - Page 11: Research by Brené Brown shows that vulnerability is at the core of shame, fear, and our struggle for worthiness. Vulnerability is also the birthplace of joy, creativity, belonging, and love. - Page 136: If you are too humble / insecure, try to speak up more, be more courageous and more optimistic. If you are too overconfident, try to listen more, take more advice and be more vulnerable. - Page 154: To be willing to be vulnerable, you must trust that the community will still receive, include you, and value you. - Page 185: People, who work for http://www.decurion.com/, are not different people at home and at work. They can be themselves. - Page 8: We are seeing a rise of the need for finding purpose, meaning, happiness, personal satisfaction, and fulfillment of what is inside of us. This change, which has values at its center, is one of the largest changes we have seen in the last 100 years. - Page 148: Leaders working for http://www.decurion.com/ hold the belief that people will grow and can do more when the right structures and conditions are available to them. Examples of living the value "learning"
- Page 90 + 182: People who work for https://www.bridgewater.com/ ask themselves this: Do I worry more about how good I am or about how fast I am learning? People are rewarded for being open / transparent about errors and problems, because errors are seen as opportunities for growth. - Page 105: People, who work for Bridgewater, distinguish between first-order and second-order consequences. An example: We may not like to exercise because the first order consequence is discomfort or lost time. As the second-order consequence is better health and more energy, regular exercise is a good choice. - Page 116: The culture of http://www.decurion.com/ puts strong focus on learning. People participate in learning communities in order to grow / develop as individuals and seize busines opportunities. Everyone is teaching and learning. - Page 124: What would happen if we design our organizations for practice instead of only for performance? Here is why it would make sense to do that: When many changes are happening around us, practicing becomes more important. When you say to people that you are practicing, you are not expecting - and others are not expecting you - to perform perfectly. By naming, what you are doing, practice, you signal that you are experimenting, learning, trying something out, working at improving, working at getting better at something. - Page 155: People continuously give and receive feedback. - Page 155: The culture says "the best job is the one you don't yet know how to do." Examples of living the value "helping"
- Page 55: The culture of http://www.nextjump.com/ puts helping others at the forefront. - Page 89: Next Jump works with the formula "better me + better you = better us." This means that Next Jump wants the company to grow = better us, but its culture continuously says, "the way we are going to be a better company is by your working on yourself and helping others work on themselves." The core idea of the book is intriguing: looking at how things might be if companies placed their focus on growing the capabilities of all of its employees through personal development and real company-wide teamwork, rather than paying lip service to the concept and building the business around a few alleged superstars. It is just that the execution of the book felt a bit flat, leading to disappointment and a fair degree of frustration. It felt as if it was repelling the reader’s attempts to focu The core idea of the book is intriguing: looking at how things might be if companies placed their focus on growing the capabilities of all of its employees through personal development and real company-wide teamwork, rather than paying lip service to the concept and building the business around a few alleged superstars. It is just that the execution of the book felt a bit flat, leading to disappointment and a fair degree of frustration. It felt as if it was repelling the reader’s attempts to focus on the subject. The problem is not due to one single thing, such as bad writing or editing, but just a combination of many small factors that seem to have reached a critical mass. One could just not really warm to the book, which is a shame as the authors appear to know their subject! A so-called Deliberately Development Organization (DDO) is central to the authors’ concept of doing things right, since the company will be organized and aligned around the strongest motive of individual employees, which is to grow, allowing individuals to prosper and work towards a common good for the company. The authors provide a deep-dive into three companies that follow DDO principles and seek to show how this can be transplanted into any organization if the desire for change is strong enough. Certainly at face value the concept is something you’d surely want to examine. It is just questionable whether you will lose patience with the book and give up part way, or whether you will force yourself to stay the course. One key area for a desire to change is by making it accessible and hardly problematic. This book just felt as if it was doing the equivalent of putting the brake on things. Maybe a radical overhaul of the book’s style would help? The idea of focusing on personal development and DDO (Deliberately Developmental Organization) is very good. And advice and practices are great. However, the style of authors is very boring, and IMHO the content could be cut in half without removing anything important. "In an ordinary organization, most people are doing a second job no one is paying them for ... spending time and energy covering up their weaknesses, managing other people's impressions of them, showing themselves to their best advantage, playing politics, hiding their inadequacies, hiding their uncertainties, hiding their limitations. Hiding. "We regard this as the single biggest loss of resources that organizations suffer every day." 3.5 stars: I've always admired the Kegan & Lahey's research and I enjoyed this book as well. I do question their claim to have identified "A Radical New Model for Unleashing Your Company’s Potential." I've read a lot of books on organizational design, workplace culture, human behavior, and adult learning/development, and I didn't see anything particularly "radical" in Kegan & Lahey's book. Certainly, they've developed a model that is different and by giving it a new name (Deliberately De 3.5 stars: I've always admired the Kegan & Lahey's research and I enjoyed this book as well. I do question their claim to have identified "A Radical New Model for Unleashing Your Company’s Potential." I've read a lot of books on organizational design, workplace culture, human behavior, and adult learning/development, and I didn't see anything particularly "radical" in Kegan & Lahey's book. Certainly, they've developed a model that is different and by giving it a new name (Deliberately Developmental Organization or DDO) they've coined a new way to view existing, timeless principles. But, radical? I didn't see that. In fact, I recently finished Bock's "Work Rules" and the underlying philosophy used to develop Google's culture is quite similar (i.e. people first), minus the structured, consulting framework Kegan & Lahey uses to describe a DDO. Sophomoric repackaging of earlier scholarly works on the topic of constructive development (e.g. Immunity to Change). Disappointingly, Kegan's work now span the spectrum from mind-numbing intelligent (The Evolving Self) to the mind-numbing idiotic (An Everyone Culture) with a continued downward trajectory projected. This is the foundational book for the Navy Leader Development Framework. This book is why the CNO wants to turn the Navy into a deliberately developmental organization. Maybe this kind of thing is up your alley; maybe it isn't. Regardless, it's your duty to read it. 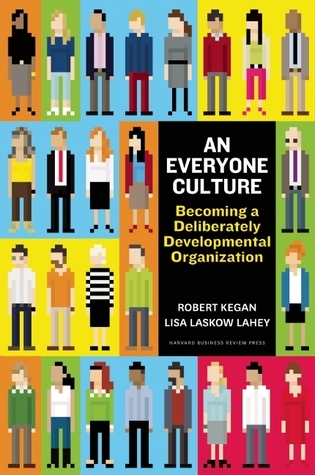 Okay, for everyone else: 'An Everyone Culture' advocates for a new model of organizational professional development rooted in the personal development of each member of that organization and the group development of teams within that organization. As a reading experience, it's akin to eating one's vegetables: authors Robert Kegan and Lisa Laskow Lahey have a dry, businesslike writing style - so dry, in fact, that it reminded me of a very dry leadership book I read last year. The title? 'Immunity to Change,' by (You guessed it!) Kegan and Laskow Lahey. Still, you've gotta eat your vegetables. This book offers examples and best practice for, at the core, bringing your "whole self" to work. Although they have termed organizations chronicled here "Deliberately Developmental Organizations" (DDOs), ultimately, it's all about the simple idea that people who can be their full selves at work are most effective at delivering results for their enterprises. After all, they say at the beginning, middle, and end of the book, most people are doing a "second job" at work, hiding their imperfection This book offers examples and best practice for, at the core, bringing your "whole self" to work. Although they have termed organizations chronicled here "Deliberately Developmental Organizations" (DDOs), ultimately, it's all about the simple idea that people who can be their full selves at work are most effective at delivering results for their enterprises. After all, they say at the beginning, middle, and end of the book, most people are doing a "second job" at work, hiding their imperfections and trying to come across as more competent or able then they actually are. Organizations that eliminate those second roles can get much more out of their people, and turn out to be much better places to work, to boot. This comes through vulnerability, transparency, and "constructive destabilization," among other characteristics. It's about getting the process right, vs. obsessing over outputs/outcomes. It's about "struggling well" to constantly get better. Typically I do not read business related books, but was recommended An Everyone Culture by a former colleague. I found the information fascinating and the book itself structured progressively. I enjoyed the two authors' suggestion to read the chapters in an order that you'd get the most use from - truly dedicated to the idea that each individual would work through the content in their own manner. As an HR professional, I found the content fascinating, but as an employee I found the DDO's inspiri Typically I do not read business related books, but was recommended An Everyone Culture by a former colleague. I found the information fascinating and the book itself structured progressively. I enjoyed the two authors' suggestion to read the chapters in an order that you'd get the most use from - truly dedicated to the idea that each individual would work through the content in their own manner. As an HR professional, I found the content fascinating, but as an employee I found the DDO's inspiring - I tend to believe my current workplace is a subset of a DDO. Even with that, I was interested in what set these business apart from the rest and how unique they were in their own rite. At first, I thought this would be nothing new after reading 'Principles' by Ray Dalio. Now it looks to me like this book might be a place to start if you are not familiar with the concepts of giving and receiving feedback, transparency, open-mindedness and becoming better self in your workplace. If you enjoyed that book you should probably read mentioned Dalio's book to gain more details about the whole process at Bridgewater. Great read and I sincerely hope the future will bring more companies a At first, I thought this would be nothing new after reading 'Principles' by Ray Dalio. Now it looks to me like this book might be a place to start if you are not familiar with the concepts of giving and receiving feedback, transparency, open-mindedness and becoming better self in your workplace. If you enjoyed that book you should probably read mentioned Dalio's book to gain more details about the whole process at Bridgewater. A bit of a weakness is that there are only a small number of companies covered in depth -- yes, the final chapter covers some in transition. It isn't enough to prove the approach. At the same time, the general concepts seem pretty well grounded both from experience and other research. And yet, even as that is true, it's been natural human instinct to run against these concepts. So from evidence, it's maybe not a four star -- you'll have to see the results yourself -- but in terms of the way modern A bit of a weakness is that there are only a small number of companies covered in depth -- yes, the final chapter covers some in transition. It isn't enough to prove the approach. The future of the workplace. It seems like a utopia although it exists and there are many examples in the boom of organizations that place the development of the people equally with and as a means to the bottom line. It requires a great deal of intention and deliberate conversations - agreements and the results are amazing!!! Coming from the private sector of cubicles and top down mentality this book offers a fresh and inspiring outlook on the future of organizations! I like the work of Robert Kegan. It helps me motivating my clients to prepare and adapt for a VUCA world. Why? A lot of books stay on a - what I call - tool-level. The work of Robert Kegan gives you a deeper understanding to support the development of companies and leaders. Yes, a fool with a tool is still a fool. 'As it happens, the authors of this book are professional educators.' This quote appears at the halfway point of this book, and at that point things made sense as this book was tough to get through, mostly dull and uninteresting but that offered up a couple of good points every now and then. Which is exactly how I felt about school. A friend, mentor, and manager of mine once relayed a conversation that he had with the HR manager at our company. The HR manager said that you couldn’t change the stripes on a tiger but – in a sense – this was exactly what my friend was trying to do. He wasn’t content with people where they were. He wanted people to grow and change and become the best possible versions of themselves, even if it was painful, as it often was. He was ahead of his time in trying to carve out his corner of the larger A friend, mentor, and manager of mine once relayed a conversation that he had with the HR manager at our company. The HR manager said that you couldn’t change the stripes on a tiger but – in a sense – this was exactly what my friend was trying to do. He wasn’t content with people where they were. He wanted people to grow and change and become the best possible versions of themselves, even if it was painful, as it often was. He was ahead of his time in trying to carve out his corner of the larger organization and make it deliberately developmental for every team member. Fascinating subject, poor execution. The chapters are organized in a way that breaks up the case studies but doesn’t lend any clarity to the concepts. The book is also stuffed with filler, like pull quotes that appear to be lifted directly from corporate websites. The Immunity to Change chapter is good, but a repackaging of prior work. 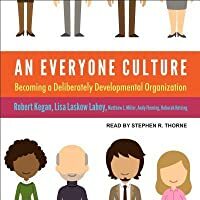 An Everyone Culture is an interesting book being researched in the new areas where company insisting on developing its people through building culture under a principle in which trust required. The book provides a three convincing case study of their people and its practice flourish over number of years. An in-depth exploration of creating a Deliberately Developmental Organization. This practice takes personal vulnerability and commitment from all levels of a company. Criticism is honest, feedback is constant, and personal growth is linked to company growth. It's radical, because few are currently embracing it. I never thought I was going to make it through this book, but mission accomplished. It was slow and poorly organized. You'll find a few valuable nuggets, but have to wade through so many boring stories and sidebars. This book is a must for anyone that wants to focus on the development of the people in the organization. Some radical stuff compared to the average company but completely worth following. We’ll be using this book as a guide for this new journey. What a wonderful journey through what is possible when organizations exist that allow our whole selves to show up! Heart, hands, and minds. Imperfections and rough edges. Perfections and sparkles. This book was recommended to me and I'd recommend it to others who have read Frederic Laloux's Reinventing Organisations or the work of Ken Wilber as it builds on the integral models they describe. A great exploration of the fixed and growth mindsets at an organisational level. As a leader in education, I love to read books about organizational change. This book offered a new look at how to grow people and has me thinking about teachers. Highly recommended! An absolutely inspiring game changer for the world of business and the world of personal development. A must-read for anyone who works, lives, and breathes. Relevant examples of good practices to a learning and individual approach in business.